The Feral Pumpkin Patch Has a Gift For You! September 13, 2016 by Feral StrumpetLeave a Comment on The Feral Pumpkin Patch Has a Gift For You! My favourite time of year approaches! Bring on Autumn! To celebrate, I’m giving away a pair of Little Pumpkin Stone Earrings with every purchase of £25 or more at feralstrumpet.co.uk and my Etsy shop until 30 September, 2016 (or until the patch is picked clean!). It’s the busiest time of year for the shop, and I’ve been working even harder to get my new website up and running for the holidays. To celebrate, I’m offering free shipping at my new online shop for the entire month of November on all orders over 15 pounds. Use coupon code WELCOME. (Offer can’t be used on reserve or custom orders and can’t be used retroactively). Taking the leap to build my own shop was a long time in the making– years, really. When I first opened my Etsy shop in 2011 I had no idea that two years later I would be making a living making beautiful things for lovely people. My favourite part of running my Etsy shop, besides making things, was thinking of names for the designs. If I couldn’t think of a name for something, I wouldn’t make it– it clearly wasn’t ready to come into the world yet! 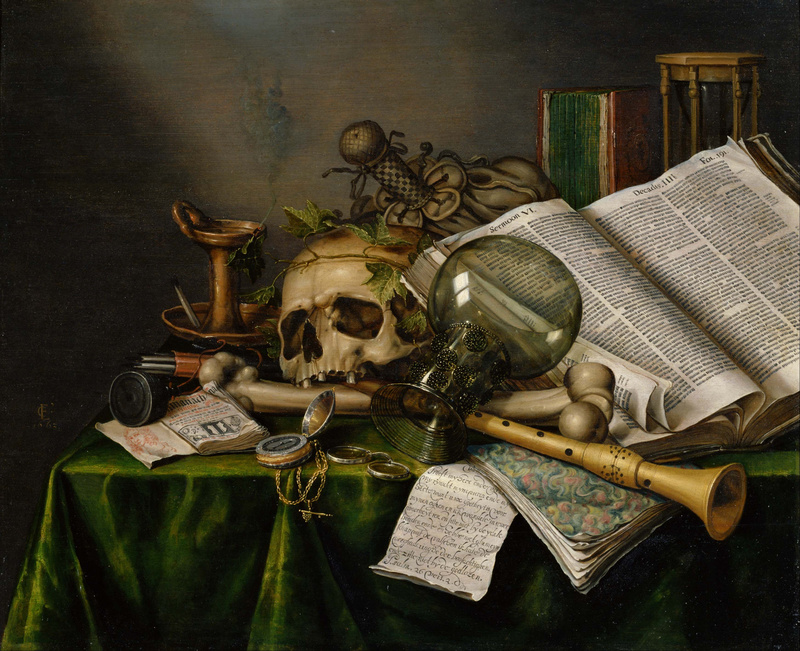 I also relished the idea of the camera as an eye on a dark corner of the imagination filled with books and mysterious objects, much like 18th century still-lifes of the mundane objects of daily life. I have tried to recreate that in my product photographs. Originally I established my shop with these aesthetics, but over the past two years Etsy has changed, specifically the search function which prioritises simple descriptions, making my poetic titles obsolete. Etsy’s emphasis on urban chic and Amazon.com-like product photography (high contrast with a white background) means it is difficult to get my moodier product photographs seen in search. Though I made changes to my item’s titles and photography in order to stay in the game on Etsy, it always felt like something was missing. I now had a lovely costumer base who continually told me they liked the names and stories that came along with my work, and the photographs that evoke these things. So I created a website where my loyal customer base can have these things, and really immerse themselves in the experience of reading and enjoying the site as they shop. Also, I’ll be offering designs and sale items exclusive to my website to reward those who visit! In my last post other artisans were asking how I set up my independent shop– I use Indiemade. Their customer service is some of the best I’ve ever received. You feel like you have this team cheerleading you every step of the way. The folks at Indiemade understand what a handmade artist might need in a web presence. At feralstrumpet.co.uk, you’ll find past custom work in galleries and archived one of a kind pieces, like my Mina Harker necklaces. 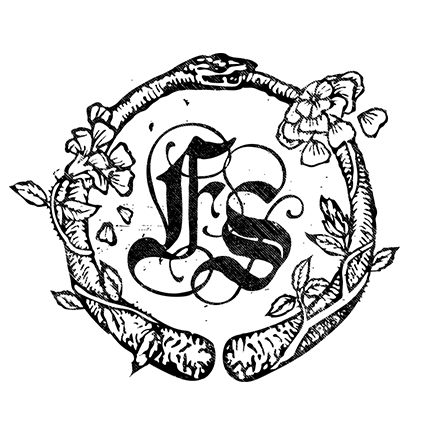 Customer praises now have a place to live next to my shop, and you can find press mentions of Feral Strumpet as well as my musings on my process— all in one place. Though Etsy has been a great place for me to get started, it’s time to grow. 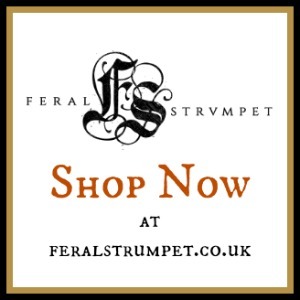 Though I’ll still keep my Etsy shop going, the real home for my designs will become feralstrumpet.co.uk. 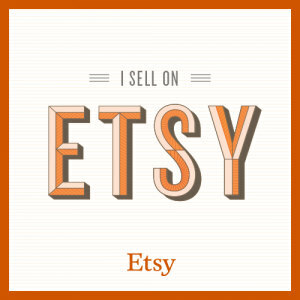 Perhaps the best part of my new site– I don’t have the share the profits with Etsy. Every pence I earn goes back to me, the artist. 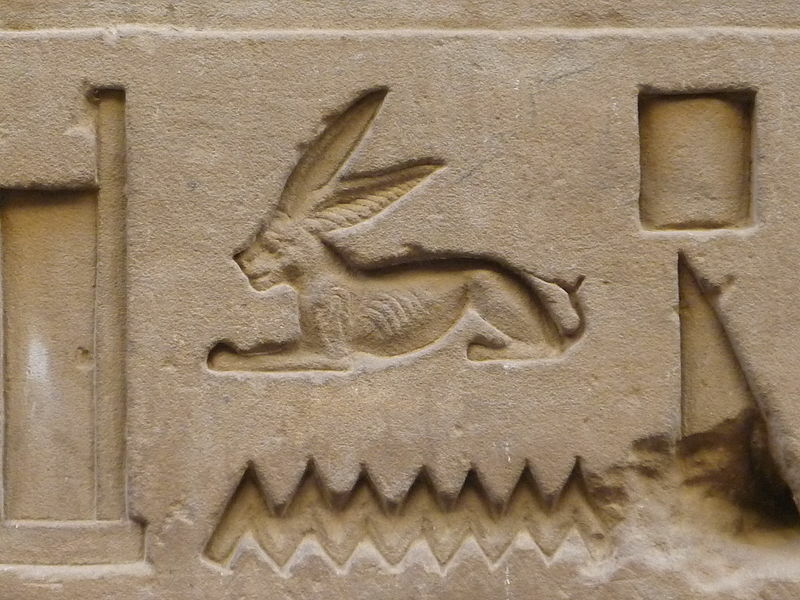 Egyptian Heiroglyph for hare also means "to be". I have been to Whitby many times for the Gothic Weekend twice a year– this year will be the first year I will be attending as a dealer! Look for me in the Leisure Centre if you will be there. Near the Shambles in Whitby, there used to be a shop with green shutters painted with three hares. That little Pagan shop has moved and the three hares are now painted over, but it was the first place I saw this sacred image. 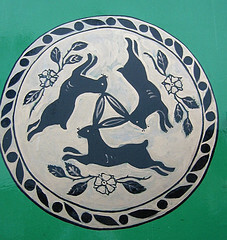 The hares form a triquetra, or three cornered shape, representing the three aspects of the Goddess– later adopted by the Christian faith to represent the Holy Trinity. They are a riddle, these “rotating rabbits”– three hairs, each with two ears, yet they only share three. This image originated in the cave temples of China, and traveled along the Silk Road to England. Sometimes called “Tinner’s Rabbits”, the symbol was adopted by tin miners in Devon. But the three rabbits also decorate mosques, and the appearance of this traveling symbol in synagogues may be a reference to the Jewish diaspora. Hares have been associated with the Virgin Mary– and most likely is attached in ancestral memory to an older Goddess, one associated with the moon and lunar cycles. In Chinese Folklore the Moon Rabbit is said to be pounding out the elixir of immortality in a mortar for the moon Goddess Chang’e. The Aztecs also have a moon rabbit legend as well as many other cultures. Some say you can see this rabbit by looking at the shadows on the moon which form its shape. One wonders if the moon gazing hare is looking up to see its big goddess in the sky– it’s a nice image to contemplate at this time of year. At least, I like to think on it. In the days before special effects, the optical illusion of the three ears must have had been amplified with a kind of shifting mystery. These rabbits turn and turn in the mind, spinning the wheel of the year toward spring. Blessed Spring Equinox, dear reader! The Hare and the Moon, Labradorite and Pewter Earrings by Feral Strumpet on Etsy. 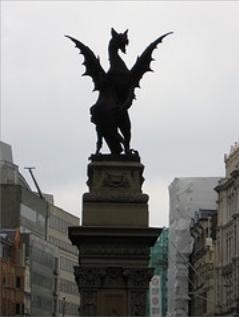 What a contrast now to find the sigil of this city, York, to be a white, five petaled mandala. I fell in love with it when I first saw it. 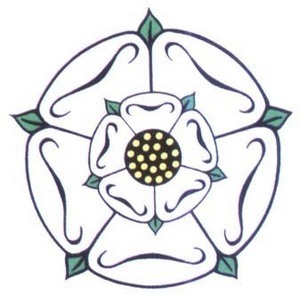 Though the history dates back to the House of York in the 14th century and the War of the Roses in the 15th century, it was really the Victorians who popularized the symbol. Great urban planners they were (though they tried to take down the city walls!) 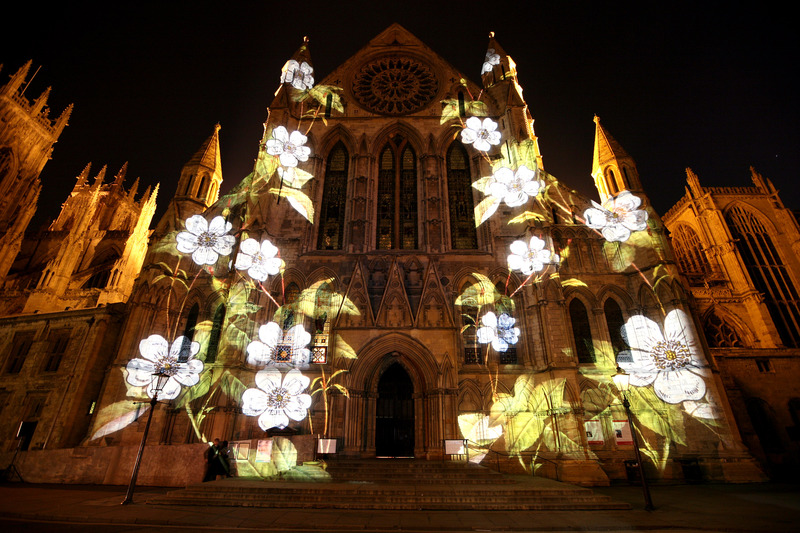 But they were also sentimentalists, and the white rose as a municipal symbol seems uniquely Victorian. Of course the rose is the Christian symbol representing Mary– and where Mary is, we are sure to find also a much older goddess that predates Christianity. The rose is a pagan symbol– with its five petals like the five arms of the pentagram. Their cyclical, spiraled structure suggests the unfurled labyrinth of faith. This is the second post of three in honor of Poe’s Birthday on Thursday. I’m celebrating by having a giveaway in my Etsy shop! Read on for details. I can’t remember my first encounter with Poe. I know I had to read The Tell Tale Heart when I was about 9 and it seared itself in my consciousness– one of those moments where you feel the initial betrayal of the universe, the dispelling of childhood. Yes, the world is a dark place! But I also have a visceral memory of the Vincent Price hour-long dramatic interpretation– reproduced in the above Youtube video. Though, I must have seen it as a re-run. Watching this I remember Price’s profound effect on me– the camp in his performance– the perfect last facet of his persona– was lost on me as a child. You could call it a crush, that feeling he gave me, but I told no one, of course! Others were cutting out pictures of Shaun Cassidy from Tiger Beat. Yeah, it explains a lot– I also had a thing for Dan Haggerty/Grizzly Adams. In Angela Carter’s meditation on Poe, “The Cabinet of Edgar Allen Poe” she imagines him as a child. His infancy is invented with her charateristic cynical compassion and narrative shifts, like facets in the void-world of the story. (She no doubt learned a trick or two from Poe–taking his unreliable narrators one step further). His mother, a vaudevillian actor, is rendered vividly– to this day I can’t think of Poe without seeing the grease-painted ghost of his mother close behind. Such is the power of Carter’s writing. And, perhaps the only thing that would make my Poe Nevermore bookmark more lovely is if it were between the covers of The Trials of Edgar Allen Poe, a collection of poems by one of my favourite poets and essayists, Ned Balbo. Today is the last day to enter the Nevermore bookmark giveaway! Blog, Tweet or click the “like” button on your favourite item in my Etsy shop to be entered to win. 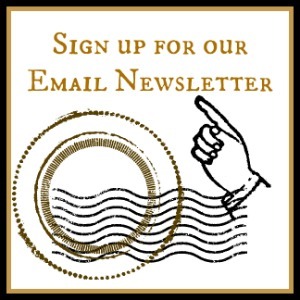 Be sure to comment here so I know to enter you. Winner will be chosen tomorrow by a highly random, Discordian approved process that may involve kittens. 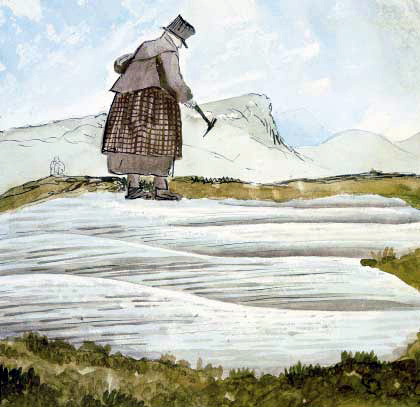 Mary Anning gleaning for fossils in Lyme Regis. 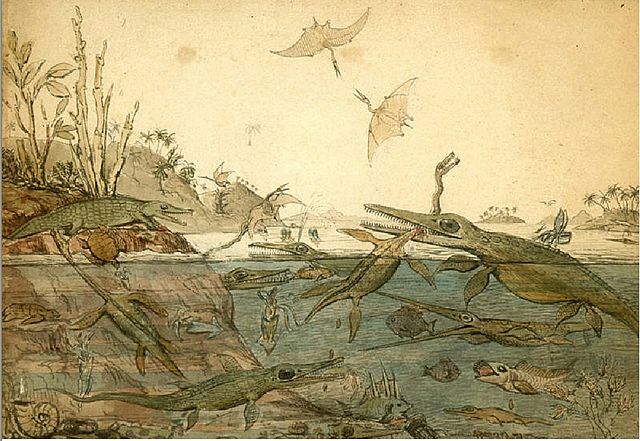 Illustration by geologist Henry De la Beche. My own life-long fascination with fossils was born from a book I borrowed in Kindergarden. I couldn’t even read the words but I remember the pictures vividly– no fairy tale landscape was this! The garish illustrations of giant lizards cavorting in acidic, apocalyptic dreamscapes– dragons to my imagination– seduced me. I announced to my grandmother that I wanted to be a paleontologist– a big word for a girl who couldn’t read very well. She pshaw’ed the idea. “Why would you want to dig around in the dirt all day, looking for old bones?” But to me they weren’t bones. I’d seen the creatures’s skeletons towering above me in the Field Museum in Chicago. They were mysterious ossuaries full of terrible beauty and the idea that I might one day find one excited me more than anything else at the time. 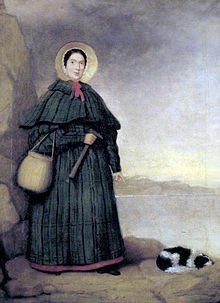 Mary Anning and her dog Tray. Behind them, the Jurassic Coast of Dorset. Anning gleaned the Blue Lias cliffs near her home in Lyme Regis, which was a popular seaside resort at the time. It was dangerous work, as the best time to search for fossils was after the frigid winter rains when landslides had revealed new fossils, but before the incoming tides took them out to sea. It was just such a landslide that almost killed her and took the life of her dog, Tray. Fossils found in the cliffs were often sold to tourists as curiosities– locals called them things like “snake stones,” “devil’s fingers” and “verteberries”. A sickly child, she survived a lightening strike as an infant, and according to her family this miraculous event changed her into the inquisitive, seeking child she became. One wonders about this traumatic event and how perhaps the immensity of time and life on earth, opening to her in those wet, muddy cliffs might have reconciled her own death while at the same time giving her the necessary fearlessness to keep working in such dangerous conditions. The daughter of a cabinet maker, she was shut out of much of the scientific community of the time and could not join the Geological Society of London because she was a woman. She was completely self taught, reading scientific journals and copying out borrowred books by hand and carrying out dissections to teach herself anatomy. Many of the more well know geologists who came to her shop, “Annings Fossil Depot”, purchased her discoveries for museums and their personal collections. Though they often knew less about these finds than she, her work was rarely credited. At the time of her early death of breast cancer at the age of 47, the Geological Society had raised money for her medical expenses and erected a stained glass window in the parish church in her honor, and after her death many species were named after her.